No one likes “Josh the Tattler” because he tattles way too much. He tattles on his classmates, his brother, and even his dog! But one night he wakes up to find his tongue is very long, yellow, and covered in bright purple spots. 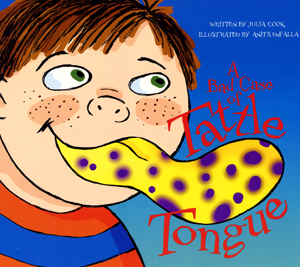 Will a bad case of Tattle Tongue help him learn the difference between tattling and telling? This book gives teachers and counselors a humorous, cleverly creative way to address the time-consuming tattling-related issues that often sap classroom energy and thwart teaching opportunities. Don’t forget, there is also an activity book for sale!